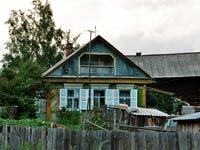 The idyllic village of Arshan in the East-Sayan Mountains is often compared with Davos or Carlsbad due to its location and the mineral springs. This might be slightly exaggerated but nevertheless its worth a visit. Arshan is an ideal starting point for trips into the mountains, to the close mineral and thermal springs as well as to the Kyngara Waterfall. Nice, but expensive 2-star-hotel built in 2006. Breakfast is included only for business class C and penthouse. 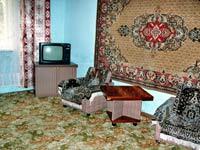 The pension offers 2- and 3-bed-rooms with toilet and shower. New camp (finished in 2010), consisting of 3 cottages with 3 rooms in each of them. You can rent a whole house. No meals offered, but cooking is possible. 3 single cottages with 3 rooms in each of them (two double rooms and one 4-bed-room). It`s possible to rent a whole building. Very simple accomodation organized by private people. Cheap accomodation in a simple wooden house. 2-3 minutes by foot to the centre of the village. Two wooden buildings with two floors offering rooms in different categories. It`s allowed to cook. The pension is situated in a new framehouse; double rooms and 3-bed rooms are available, incl. en suite facilities. By the time busses or Marshrutkas arrive from Irkutsk or Sludyanka a small crowd of people has usually assembled in front of the station. They hope to rent single rooms or even complete houses to tourists and to earn some money in doing so. Those rooms are usually very simple, the guests will have to be satisfied with outhouses and a close-by river that serves as washing facility. On the other hand, thus, an insight into the simple lives of Buryats is being given and often it is a great opportunity to talk to locals.